cDepartment of Neuroradiology (H.B. ), CHU La Timone, Marseille, France. BACKGROUND AND PURPOSE: Flow-diverter technology has proved to be a safe and effective treatment for intracranial aneurysm based on the concept of flow diversion allowing parent artery and collateral preservation and aneurysm healing. We investigated the patency of covered side branches and flow modification within the parent artery following placement of the Pipeline Embolization Device in the treatment of intracranial aneurysms. MATERIALS AND METHODS: Sixty-six aneurysms in 59 patients were treated with 96 Pipeline Embolization Devices. We retrospectively reviewed imaging and clinical results during the postoperative period at 6 and 12 months to assess flow modification through the parent artery and side branches. Reperfusion syndrome was assessed by MR imaging and clinical evaluation. RESULTS: Slow flow was observed in 13 of 68 (19.1%) side branches covered by the Pipeline Embolization Device. It was reported in all cases of anterior cerebral artery coverage, in 3/5 cases of M2-MCA coverage, and in 5/34 (14.7%) cases of ophthalmic artery coverage. One territorial infarction was observed in a case of M2-MCA coverage, without arterial occlusion. One case of deep Sylvian infarct was reported in a case of coverage of MCA perforators. Two ophthalmic arteries (5.9%) were occluded, and 11 side branches (16.2%) were narrowed at 12 months' follow-up; patients remained asymptomatic. Parent vessel flow modification was responsible for 2 cases (3.4%) of reperfusion syndrome. Overall permanent morbidity and mortality rates were 5.2% and 6.9%, respectively. We did not report any permanent deficit or death in case of slow flow observed within side branches. CONCLUSIONS: After Pipeline Embolization Device placement, reperfusion syndrome was observed in 3.4%, and territorial infarction, in 3.4%. Delayed occlusion of ophthalmic arteries and delayed narrowing of arteries covered by the Pipeline Embolization Device were observed in 5.9% and 16.2%, respectively. No permanent morbidity or death was related to side branch coverage at midterm follow-up. Flow-diversion systems appear to be promising tools for the treatment of giant, wide-neck, or fusiform intracranial aneurysms.1⇓⇓⇓⇓⇓⇓–8 It allows not only the exclusion of the aneurysm sac but the treatment of the diseased arterial segment located on either side of the device by changing the hemodynamic conditions.9,10 Blood flow is supposed to be disrupted in the aneurysm sac, while parent artery and collateral branches remain permeable. Modification of intra-aneurysmal flow after the implantation of flow diverters has been described as well in experimental and computational models,11⇓–13 but extra-aneurysmal flow modifications have rarely been explored. Clinical complications such as delayed aneurysm rupture,14⇓–16 delayed intraparenchymal hematoma,17 and slow flow or occlusion of collateral branches covered by the device18 have been reported, with sparse knowledge, considering the frequency. The purpose of this study was to focus on hemodynamic changes induced by the Pipeline Embolization Device (PED; Covidien, Irvine, California) in collateral branches, perforators, and the parent artery. We retrospectively analyzed the clinical and radiologic data of all consecutive patients treated with the PED from July 2009 to June 2012 in 2 large French neuroscience centers. Therapeutic options were discussed by a multidisciplinary team. Patients were treated with endovascular reconstruction if they had wide-neck aneurysms (neck size, ≥4 mm, or dome-to-neck ratio, <2) and/or if therapy was not feasible by conventional techniques (coils with or without remodeling or surgical clipping). The aneurysms treated were blister-like, fusiform, large, and giant aneurysms. The study was conducted following approval by an ethics committee, and written informed consent was obtained from every patient. All patients were treated under general anesthesia and premedicated with clopidogrel (300 mg the day before). Platelet function was evaluated by using a VerifyNow P2Y12 assay (Accumetrics, San Diego, California) in the angiography suite just before the procedure.19 Procedures were performed with the patient under systemic heparinization with an activated clotting time between 250 and 300 seconds. At the end of the procedure, each patient was given an intravenous bolus of 250–500 mg of aspirin, and heparin anticoagulation was maintained for 24 hours. Dual antiplatelet medication was then introduced (clopidogrel, 75 mg, and aspirin, 75 or 160 mg) and was maintained for at least 6 months following the procedure. At 6 months, clopidogrel was stopped and aspirin was maintained life-long. All procedures were performed by a senior interventional neuroradiologist with experience in stent-placement techniques. The PED was implanted via a femoral artery approach across the aneurysmal segment; then, the delivery was via a 0.027-inch internal diameter microcatheter (Marksman; Covidien) that requires a 6F guide catheter support. Morphologic characteristics of the aneurysm (morphology, volume, and neck size) and parent artery (diameter of the proximal and distal segment and collateral branches) were analyzed by using 2D and 3D reconstructed images to select the optimal device size and length. A neurologic examination was performed after the procedure. In the absence of a significant abnormality, patients were discharged after 72 hours. In cases with complications, a brain CT or MR imaging was performed. In the absence of clinical adverse events, patients were clinically followed by a stroke practitioner postdischarge at 6 and at 12 months after the procedure. All clinical adverse events (stroke, SAH, headache, nerve palsy, mass effect, or visual deficit) were documented in our prospectively populated data base before the procedure and then were re-evaluated during follow-up. Follow-up included an MR imaging or conventional angiography at 6 and 12 months. We retrospectively analyzed flow modifications within side branches covered by the device. This assessment was made on the angiogram obtained immediately after the stent deployment, by using the same acquisition parameters (volume injected, speed, x-ray delay) as those obtained immediately before the implantation of the device. Flow modification was subjectively assessed by using a 3-point scale: 1) no modification (if the flow was the same as that before device deployment), 2) slow flow (if the contrast material became slower within the covered vessel), and 3) occlusion (if no contrast material entered the vessel). During the follow-up imaging, patency of side branches covered by the device was determined and the vessel size was reported as unchanged, narrowed, or occluded. All conventional angiograms and MRIs were reviewed by 2 neuroradiologists and adjudicated in cases of disagreement. In addition to patency of collateral branches, baseline characteristics including patient age, aneurysms morphology, size, and location were also reported. Between July 2009 and June 2012, 66 aneurysms in 59 patients were treated with the PED in 2 French neuroscience centers (Table 1). Fifty patients were treated by 3 operators in Montpellier, and 9 patients were treated by 1 operator in Marseille without any significant imbalance between these 2 centers. A total of 96 devices were used to treat 66 intracranial aneurysms (1.5 device per aneurysm). PED deployment was achieved in 92 cases (95.8%). Four devices (4.2%) could not be deployed. No parent artery occlusion was reported during the perioperative period. Coils were deployed in 7 aneurysms (10.6%), including 2 ruptured aneurysms. Coils were not used in cases of potential risk of side branch occlusion. PED implantation alone was performed in 59 aneurysms (89.4%). Patients were treated with 1–5 PEDs (the number of PEDs implanted was 1 in 48 cases, 2 in 10 cases, 3 in 2 cases, 4 in 3 cases, and 5 in 2 cases). 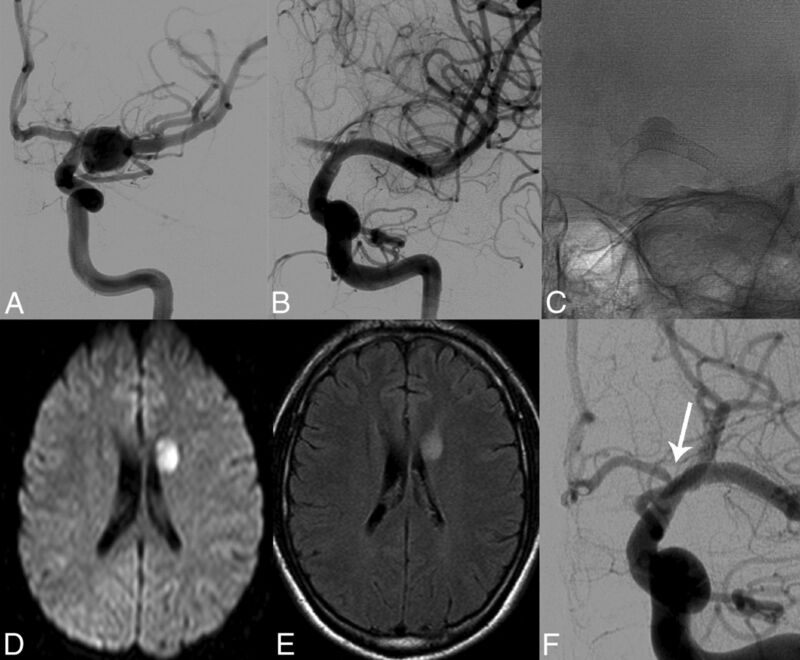 Multiple PEDs were used with telescopic reconstruction in cases of large-neck aneurysms or to treat different aneurysms in the same arterial segment. Sixty-eight visible side branches were covered by the device. Immediately after PED placement, slow flow was angiographically identified within 13 branches (19.1%), including 5 of 34 (14.7%) ophthalmic arteries (Table 2), 5 of 5 (100%) anterior cerebral arteries (ACAs), and 3 of 5 (60%) M2-MCAs. In all cases of ACA coverage, the anterior communicating artery was functional. No side branch occlusion was demonstrated on the immediate angiography. Five patients presented with transient neurologic deficits. Four had multiple side branch coverage. Territorial ischemic lesions on MR imaging were reported in 2 cases: The first case was a 30-year-old man (patient 3) treated for a left dissecting ruptured MCA aneurysm. The covered branches were the ACA and MCA perforators, and an MR imaging performed the following day demonstrated a deep MCA infarct (Fig 1). The second case was a 60-year-old woman (patient 22) treated for an incidental MCA bifurcation aneurysm with a branch originating from the sac. On the final angiographic runs, slow flow was observed within the anterior MCA bifurcation branch (Fig 2). After extubation, the patient presented with mild aphasia, and MR imaging identified an MCA infarct. The patient was discharged without a significant deficit. Two patients with basilar artery PED placement died, one patient, in unclear circumstances, probably secondary to a delayed rupture (patient 11), and the second following in-stent thrombosis (patient 24) related to premature discontinuation of antiplatelet therapy. Perforator infarction following PED placement and arterial narrowing of the covered artery on a 12-month follow-up angiogram. A, Anteroposterior view shows the dissecting aneurysm of the left proximal M1 segment. B, Anteroposterior view after PED placement shows absence of filling of the aneurysm and slow flow within the A1 segment. The acquisition was performed with the same parameters but in a later phase to see the A1 segment. C, Single PED placement within the left M1 segment results in contrast stagnation within the aneurysm sac. D and E, DWI and FLAIR sequences performed 2 days later because of transient right brachiofacial hemiparesis demonstrate basal ganglial infarction. F, Twelve-month follow-up angiogram shows the ostial narrowing of the covered collateral branches (arrow). Slow flow within MCA side branch. A, Left MCA aneurysm treated with a PED covering the prefrontal branch. B and C, Slow flow within the covered side branch (arrows). D and E, MR imaging performed on day 1 after the procedure shows acute left anterior MCA infarct. During follow-up angiography, 66 of 68 (97%) visible side branches covered by the PED remained patent with normal blood flow. We reported 2 cases (5.9%) of ophthalmic artery occlusion on the 12-month follow-up angiogram. Eleven cases (16.2%) of collateral branches remained patent but had an arterial narrowing, which was observed in all cases of ACA coverage. In all these cases of occlusion or narrowing, patients did not have transient or permanent deficits. The 2 patients with delayed ophthalmic artery occlusion had no flow modification on the angiogram immediately after PED placement. The 13 side branches with slow flow noted just after the procedure remained patent at 1-year follow-up. The mean number of PEDs implanted in cases of occluded side branches was 2 (range, 1–3) versus 1.35 (range, 1–4) in cases of normal blood flow within side branches. Among 59 patients initially included in the study, 1 patient was lost to follow-up. Fifty-eight patients with 65 intracranial aneurysms underwent PED placement and discharge evaluation. During the hospitalization, we reported 19 (32.3%) minor reversible clinical adverse events: Six (10.3%) patients had headache, 5 (8.6%) had femoral puncture hematomas, and 8 (13.8%) had transient neurologic deficits. Two patients (1 man and 1 woman; respectively, 82 and 78 years of age) treated for a large carotid cavernous aneurysm presented with transient hemiplegia within 5 hour after the procedure. In both patients, flow decrease was not observed during the procedure, and blood pressure was stable around 90 mm Hg without evidence of tensional disturbance during the procedure. On the MR imaging performed (Fig 3), there was no evidence of new ischemic or hemorrhagic lesions and the intracranial arteries remained patent. FLAIR images showed leptomeningeal hyperintensity without enhancement on the postgadolinium images. On the PWI sequence, there was no hyperperfusion seen. The neurologic deficit improved during several days, and the follow-up MR imaging performed 5–7 days after the procedure showed complete resolution of the leptomeningeal signal change. Imaging findings in a patient presenting with cerebral reperfusion syndrome. The patient was treated for a large left carotid cavernous aneurysm with the implantation of 2 overlapped PEDs (A). Seven hours after the procedure, the patient had severe headache and mild aphasia. B and C, FLAIR images show leptomeningeal hyperintensities in the left hemisphere (arrows) without evidence of hemorrhage on T2 gradient-echo (C). D, FLAIR performed 24 hours after the procedure shows complete reversibility of leptomeningeal hyperintensities. At 12 months' follow-up, the overall morbidity rate was 5.2%, and the mortality rate was 6.9% (overall morbimortality rate of 12.1%). The rate of mortality was 27.3% in the posterior circulation and 2.1% in the anterior circulation. Three patients died during follow-up, at days 10, 15, and 25. Deaths were related to in-stent thrombosis in 1 case and delayed aneurysm rupture in 2 cases. 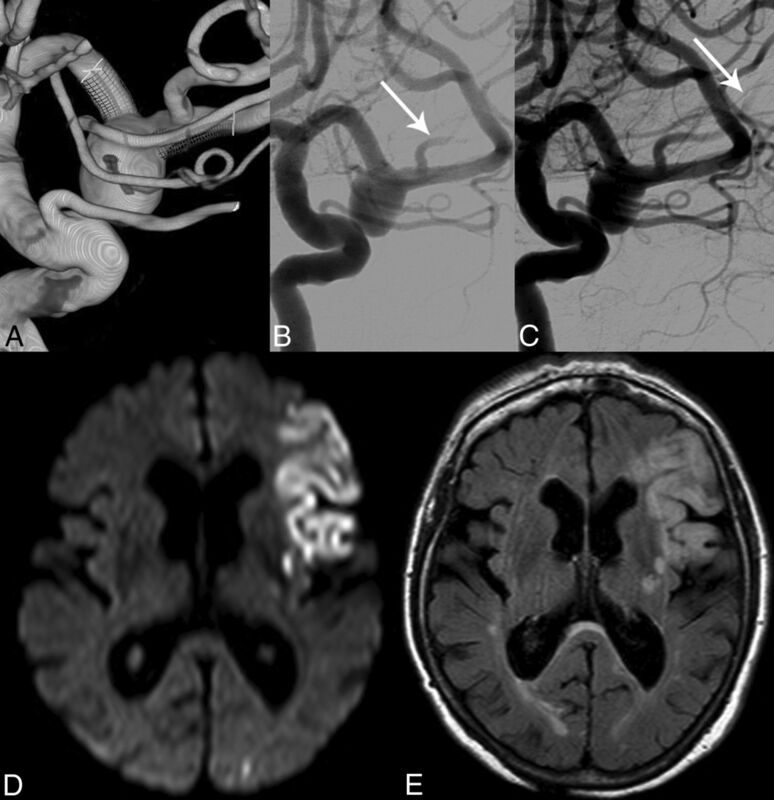 Delayed aneurysm rupture occurred in an 86-year-old woman treated for a large basilar artery aneurysm in 1 case and a 56-year-old woman treated for a large carotico-ophthalmic aneurysm in the other case. One other patient died during further treatment performed 13 months after the initial therapeutic phase because of persistent aneurysm filling. No permanent morbidity or death was related to side branch coverage. In our overall cohort, delayed occlusion of the ophthalmic artery, covered by the PED, occurred in 2 cases (5.9%) but was clinically silent. In the literature, patency of collateral branches is rarely reported. Concerning the ophthalmic artery, Szikora et al6 reported immediate occlusion in 1 case, resulting in a retinal branch occlusion and a small visual field deficit, and delayed occlusion at 6 months in 2 other cases, which were clinically silent. This finding is consistent with a rate of delayed ophthalmic artery occlusion of 11.7%. More recently, Puffer et al18 observed that 21% of the ophthalmic artery covered by a PED appeared occluded in subsequent angiographic follow-up. All reported cases of ophthalmic artery occlusion were clinically silent, perhaps due to the good collateral circulation.18 In another study, Yu et al20 did not report any occlusions among 107 ophthalmic arteries covered by the PED. Overall, the placement of 1 or multiple PEDs across the ophthalmic artery appears safe. In our study, as well as in the article by Szikora et al,6 we did not report other side branch occlusions (anterior choroidal artery, posterior inferior cerebellar artery, superior cerebellar artery, posterior communicating artery, anterior spinal artery, ACA, or MCA). Brinjikji et al21 reported an occlusion rate of 27% in cases of posterior communicating artery coverage without neurologic deficit. In all these cases, the P1 segment was patent on the initial angiogram. In our series, slow flow was observed immediately after PED implantation in all cases of ACA coverage and in 3 of 5 cases of M2-MCA coverage. Most interesting, territorial infarction resulting in a transient aphasia was observed in only 1 case of M2-MCA slow flow. In our series, 16.2% of collateral branches covered by the PED had arterial narrowing on the 12-month follow-up angiogram. In no case was it associated with a neurologic deficit. All cases of ACA coverage presented with delayed arterial narrowing. All patients had a patent anterior communicating artery and contralateral A1 on the initial imaging. Late narrowing or occlusion was observed in 38% (5/13) after initial slow flow and was observed in only 14.5% (8/55) when slow flow was not reported just after stent placement (P < .05), suggesting that peroperative slow flow is a strong predictor of late branch occlusion. In the literature, narrowing of collateral branches is rarely reported. Preclinical studies9,22⇓⇓⇓–26 reported that flow within collateral arteries was maintained after the placement of a flow diverter. However, these arteries were considered end vessels without distal collaterals. In a clinical study, Brinjikji et al21 observed a decreased flow in 18% of posterior communicating arteries covered by a flow diverter with a patent P1. These findings suggest that the placement of a flow diverter is probably responsible for a vascular and hemodynamic remodeling of regional branches covered by the device, which can lead to arterial narrowing at midterm follow-up. This vascular remodeling is probably favored by flow competition from communicating arteries. The narrowing or occlusion of such arteries remains clinically silent due to good collaterality. In our practice, we now check the patency of the anterior communicating artery before placing a flow diverter in this segment. Among the 5 cases of lenticulostriate coverage, we reported 1 case of infarction. This patient was treated for a dissecting MCA aneurysm with the placement of 1 PED, and it is not possible to conclude whether the infarct was due to extension of the dissection to the lenticulostriate arteries or due to the device. Overall, PED placement across perforating lenticulostriate arteries remains safe, probably due to the discrepancy between the wire size of the PED (30 μm) and the diameter of lenticulostriate arteries (mean, 480 μm; range, 100-1280 μm).27 Furthermore, in a computational model, Appanaboyina et al25 observed that the coverage of 90% of the perforating vessel ostium reduced <10% of the flow through the inlet. These data suggest that even if 3 wires cross a perforator ostium with a diameter of 100 μm, the coverage of the orifice area will never be >90%. However, tiny thrombi can develop on the surface of the PED and then migrate distally. A recent in vitro study observed that flow reduction within side branches was higher in cases of tight mesh or overlapping stents24; however, previous preclinical studies9,22,28 did not observe side branch occlusion in rabbit models even when small branches, similar in diameter to human perforating arteries, were covered by 1 or multiple overlapped PEDs. In our study, the number of overlapped PEDs implanted covering the lenticulostriate arteries was not a predictor of perforator infarction. Patency of perforating arteries in human clinical studies is rarely reported in the literature. van Rooij and Sluzewski29 observed a case of perforator infarction in the territory of the lenticulostriate arteries covered by the flow diverter. Phillips et al30 reported 3 cases of perforator infarction in the vertebrobasilar territory. Overall, the risk of occlusion of perforating arteries appears low, assuming an effective antiplatelet therapy. 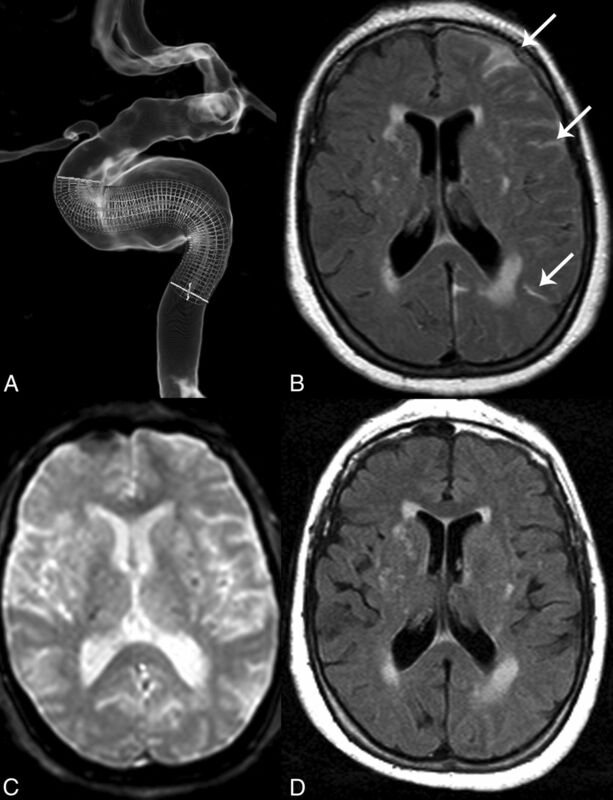 Recently, Chiu and Wenderoth38 reported a case of hyperperfusion syndrome following flow-diverter treatment of a large paraclinoid aneurysm for which the clinical presentation and MR imaging findings were similar to those of our patients except that in this case, there was hyperperfusion on CT perfusion. In our study, there was no evidence of hyperperfusion on PWI-MR imaging; hence, we have to use the term “reperfusion syndrome”.31,39 Murakami et al40 hypothesized that before treatment, giant aneurysms are responsible for the reduction in blood flow through the distal parent artery and might cause relative hypoperfusion in the ipsilateral cerebral cortex. Following aneurysm clipping, blood flow through the parent vessel suddenly increases, exceeding cerebral autoregulatory abilities, leading to cerebral hyperperfusion. One may hypothesize a similar phenomenon in aneurysms treated by surgical clipping or flow diverters, in which the stent redirects most of the blood flow into the parent artery. These data were reported in a computational fluid dynamics model,41 in which an increase in blood flow was observed in the parent artery after PED placement. As in previous studies,17,42 we hypothesized that these hemodynamic modifications after flow diversion could lead to delayed intraparenchymal hemorrhage. Two patients died in unclear circumstances, and we strongly suspect delayed aneurysm rupture. These fatal events occurred a few days or weeks following flow diversion. Similar events have already been reported for the PED and Silk flow diverter (Balt Extrusion, Montmorency, France).14⇓–16,43,44 The reason for delayed aneurysm rupture is still uncertain. In computational models, Cebral et al14 observed, after the placement of a flow diverter, an increase of intra-aneurysmal pressure, which could lead to rupture, especially in cases of giant aneurysms, tortuous vessels, or pre-existing proximal parent artery stenosis. Most of these ruptures have been described in cases of large or giant aneurysms treated by flow diverters alone. Hence, some authors recommend the combined use of coils15,43 for large and giant aneurysms and suggest a modest reduction of systemic blood pressure in the postoperative period. A limitation of this study is the relatively small number of aneurysms treated and side branches covered by the device, which can diminish the differences between groups. Thus, we did not perform any statistical analyses. Another limitation is the follow-up period, which may be too short to assess the long-term patency of side branches, especially those with narrowing on the midterm follow-up. After PED placement, reperfusion syndrome was observed in 3.4%; slow flow within side branches, in 19.1%; and territorial infarction, in 3.4%. Delayed occlusion of the ophthalmic arteries and delayed narrowing of arteries covered by the PED were observed in 5.9% and 16.2%, respectively. No permanent morbidity or death was related to side branch coverage at midterm follow-up. Disclosures: Alain Bonafé—UNRELATED: Consultancy: Covidien. Vincent Costalat—UNRELATED: Consultancy: Sequent Medical, MicroVention, Codman, Stryker; Payment for Lectures (including service on Speakers Bureaus): Stryker, Sequent Medical, Balt Extrusion; Payment for Development of Educational Presentations: Covidien, Stryker, MicroVention. Accepted after revision September 19, 2014.